Sometimes a girl just needs to hide. As I laid on the floor in my LR this morning with my prayer book and a letter from a ministry we receive, my words to the LORD were: Sometimes, Father, I want to pull down all the blinds, lock all the doors and hide in my house. For just a little while withdraw from the clamor of the world outside the front door and steal away in the peace of the quite place. It’s okay. Even Jesus had to withdraw from the crowds who were constantly pulling on him. It’s okay to hide now and then when the waves get too high, the sounds too loud. Rest today. Yes, sometimes we need to hide in the shadow of faith–resting in quiet and filling our aching minds with words that strengthen. Lovely meme! Thank you for that sweet reminder of how we have been blessed to know of that hiding place. There is a world full of people I pass everyday who need to know of that place where they can hear those songs of deliverance from their pain and depression. Lord let me see them. Thank you so much for visiting CMB. It’s so nice to meet you! 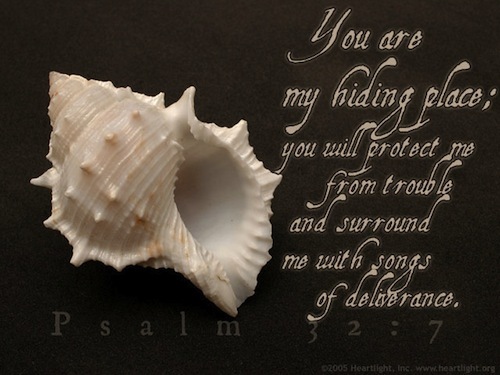 What a blessing it is to know that when I feel the need to hide; I can hide in Him. So much strength, peace, and hope in these words. I know that feeling all too well! Rest in His peace my friend. In addition to knowing the obvious …also know that you are loved by me and so many others! So true. Thank you. The shell reminds me of listening to God’s voice. Lately that is what i’ve been trying to do. Just to rest and have Peace, and Hide! DITTO!!!!!!! A head cold, packing to head to Fl knowing what I have just packed here I have to “un-pack” when I get back I just want to hide under the covers. Life in the “real” world seems to be getting a bit crowded with so much turmoil….wish more knew of the “real” in eternity. Hope you got your package. Hugs to the kids and grandkids. xo but not for too long, sister. This is definitely me right now. I just want to stay in my house and clean, and not venture out into the world. I am so glad you are in a better place this September 3rd. And secondly, a year ago we hadn’t even met yet. Thankful for the blessing you have been to my life this past year lady.